Welcome to Day #4 of Ecuador Chocolate Theme Week. The countdown continues, as we approach (Sept. 11), the 10-year anniversary of Chocolate Banquet. I'm happy to get "back to the essence of the bean" this week, with a series of dark chocolate bars crafted from Ecuadorian cacao. 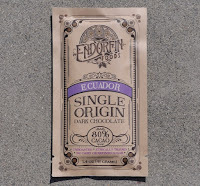 Today's Ecuador Single Origin Dark Chocolate 80% cacao bar was from Endorfin Foods (Oakland, CA). Made with "unroasted and ethically traded" cacao—without dairy, soy, gluten, GMO ingredients or refined sugar—this two ingredient bar was made with cacao and coconut sugar. The Endorfin bar had an intriguing rich cocoa + fermented cacao + raisin fruit aroma and an even, dark flavor. 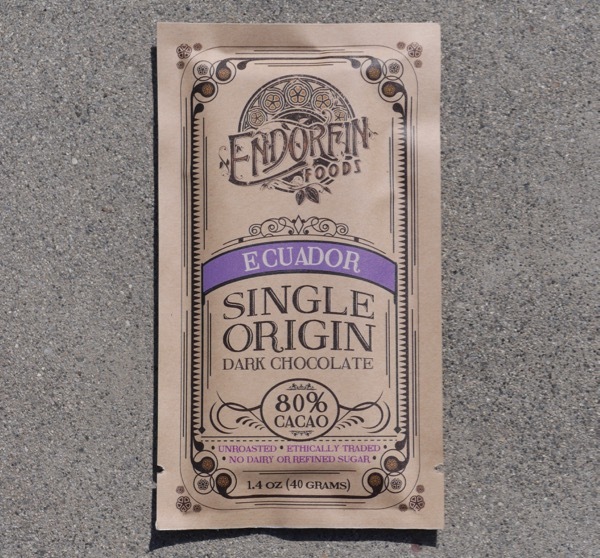 This 80 percent cacao Ecuador bar was made from unroasted cacao. It had a pleasing, mild sweetness, and a lack of bitterness that some will find surprising for high percentage chocolate. The bar also had a clean finish.